There are a number of alternatives for putting a small bathtub into a bathroom with small space. Most people believe that a bathtub needs to be huge in order to be exotic or elegant, this is not the case. When working in confined or limited space in the bathroom, one option is to make the tub deeper instead of larger. Soaking is still comfortable because the person sinks deeper into the tub thereby less length is required while still remaining comfortable. Japanese tubs or tiny bath tubs are gaining momentum in terms of popularity; the purpose of a small Japanese tub is for soaking, not merely for getting clean. In fact, the bather would wash his or herself before stepping into the hot water. Some American companies have followed this Japanese tradition and built deep tubs for small spaces, but of course mainly for bathing. In addition to saving space, walk-in bathtubs are useful for handicapped, the elderly, and anyone relying on easy access. Furthermore, the small “Claw Foot” tubs are very deep, and they can often fit nicely into awkward spaces. Instead of deciding that there is not enough space in the bathroom and that the only option is to add a shower, be sure to thoroughly investigate the small bathtub options out there. The benefits that come from choosing a bath instead of a shower should be looked at as an influencing factor: it reduces stress, aids with certain injuries, and it’s just more attractive to home-buyers. Even for bathrooms that have enough space, why not see if a small bathroom works well, in that environment, to ensure that it doesn’t become crowded? There are tiny bathtubs that fit tightly in the corner. By choosing a corner unit, one can avoid a costly bathroom renovation. The following are a list of some of the most popular, current models of small bathtubs: the Jacuzzi H52y Whirlpool white, tiny bath tub lightens the bathroom, as well as soothes a tired athlete with its powerful jets. The Maax Sincerity bathtub is rustic, brown and beautiful; it isn’t long, it’s deep. It comes with an integrated seat for additional comfort. 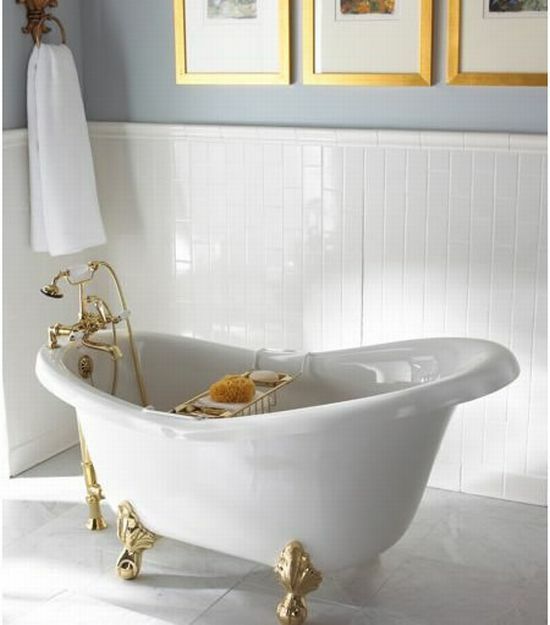 If the buyer wants to revert back a hundred years or so, the Abbey Hammered Copper tub connotes originality, and it looks like an expensive antique. It has a gorgeous copper faucet that droops over the tub. This tub is truly portable because it sits on stylish copper legs making it easy to move. The design will ultimately depend on which style fits best for the bathroom in question. Some deep tubs for small spaces have thick or thin ridges, others have clean, modern designs, and still additional styles and models seem to date back a hundred years or so. The overall decision should be based on the decorative essence of the bathroom color design.